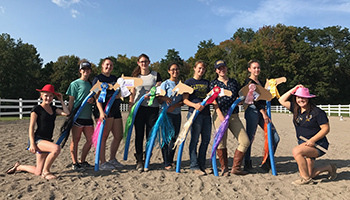 The Equine Ambassador Club (E.A.C.) is one of the service clubs at Cazenovia College. E.A.C's mission is to contribute to the college community through the love of horses. Club members participate in numerous community service activities throughout the academic year. Some ways that the club impacts the community include: walking the CROP walk for hunger with the miniature horses, highway clean-up, taking the miniature horses to the library and nursing homes, and canned good drives. The E.A.C. has been a facet of the Cazenovia College campus for many years. The service group welcomes to its ranks any student looking to lend a hand to the community. E.A.C. 's president, Lauren Smith says that, "At the end of the day, we are a service group. The goal of the E.A.C. is to better the community and have fun while doing it! If I can make a difference here, then I'm going to." While providing a service to the community (with the help of some little furry friends), members of the club form close relationships. The big and little program was initiated last year, and it is very similar to gaining a sibling. Upperclassmen are paired with new members joining the club. "It is someone to go to if you have questions or need someone to talk to," Smith adds. This program exemplifies the idea of the club being a family whose mission is to have a great time while helping the community. And even after leaving the campus, E.A.C. members maintain their close bond. Smith explains that the club sees former member continue to participate through social media. "We have girls commenting on our Facebook page that are in their 30s," Smith said. One event that the club hosts every year is the holiday party. This event is open to all students! There are roughly 73 horses on the property at the Equine Education Center, and every single one of them gets a stocking. The stockings are decorated and displayed on the stalls at the Equine Center to spread some holiday cheer. But if you are going to participate, Smith says, "You better get there quick!" Some people are very protective of their favorite horse at the barn. Growing up Smith says the philosophy of her family in regards to animals was, "Unless we can eat it, we aren’t getting animals." Now, Smith shares a different philosophy, using animals to bring fun community service opportunities to the campus. In doing so she has proven that sometimes an animal’s greatest purpose is to be loved and spread joy. For more information, contact club president Lauren Smith lmsmith@cazenovia.edu. New members are welcomed to meetings, which are held twice a month at two different times to accommodate those who may not be able to make one of the times.